WaveDrum Oriental, Other Electronic Percussion from Korg in the WaveDrum series. Korg announces the new Wavedrum Oriental Dynamic Percussion Synthesizer, a limited edition version of Korg's Wavedrum designed specifically for Middle Eastern music. 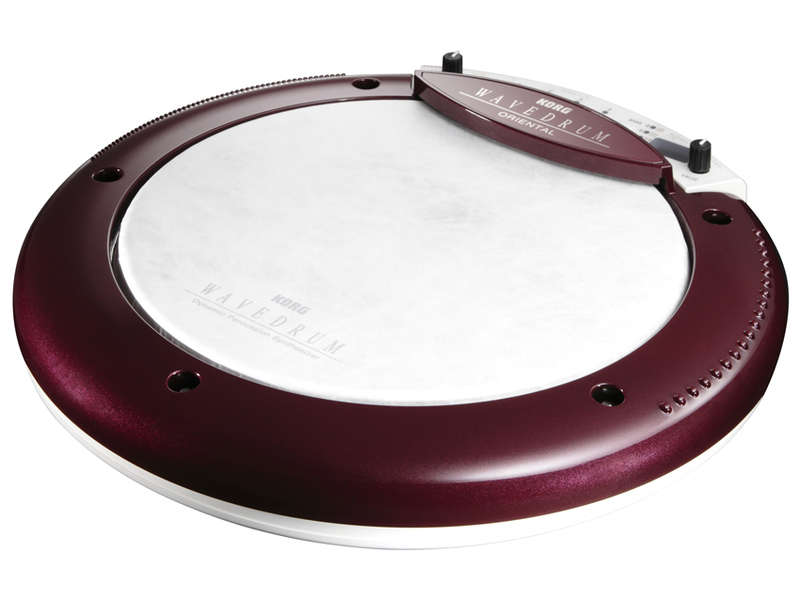 The Wavedrum Oriental has an infusion of percussion sounds, playable from the Wavedrum's dynamic rim and real drum head surface. It offers new, specialised algorithms and samples designed for the percussionist seeking Middle Eastern percussion sounds. New samples featured on the Wavedrum Oriental are dedicated to various instruments such as Darabuka, Danhola, Drinkga, Sagat, Riq, Def, Tar, Bendir and more. The striking surfaces of these instruments are simple, yet they are able to produce a wide range of timbres. The Wavedrum is distinguished by its synthesis technology and by an interface that allows a direct physical method of performance, making it the ideal instrument for replicating and articulating these exacting sounds, according to Korg. All of the Wavedrum Oriental's new sounds are designed to simulate the distinctive ways in which tone is affected by subtle nuances in playing technique and the position of the strike on the instrument – the Darabuka with its thin single skin, the Riq with its single skin and jingles and the dual-skinned Bendir, for example. The number of preset programs has been increased from the original Wavedrum's, and now stands at 150 editable preset programs, with 150 additional locations to store customized programs. The Wavedrum Oriental's appearance has also been changed. The body is a white tone reminiscent of a Darabukka's ceramic body, complemented by a deep red wine-colour rim. [NAMM] Roland TD-4K2 &TD-4KX2 V-Drums Roland introduces two new entry-level kits in the V-Drums range: the TD-4K2 and TD-4KX2.